The Moose is on the Loose in this action-packed issue! 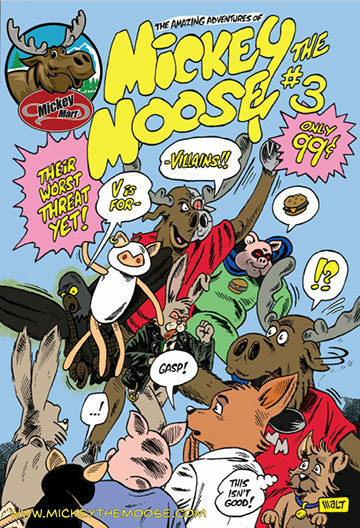 This 20-page comic unfolds with Mickey the Moose and his friends being challenged by a group of supervillains who have a grudge against Mickey. A series of battles ensue with the heroes needing to rely on their wits against the powerful bad guys. Dirk Drudgler and Kelly Walt are back with this third installment of a planned four-part series. “This is the best one yet. It’s the one we’ve had the most fun putting together, ” says Drudgler. The comic is available in a PDF version for 99¢, or a print version for $3.00 (shipping included). The print version is limited to 100 copies.